Who replaced my living room with a skating rink? Traction is so easy to take for granted until it’s gone. One day your dog leaps across the tile floor with the skill of a mountain goat. In what seems like no time at all he’s hesitating on his way across the kitchen to the food bowl. THE MOMENT YOU NOTICE YOUR DOG SLIPPING IS THE TIME TO ACT. Unfortunately tile & hardwood are not natural surfaces for our dog’s paws. Younger athletic dogs manage pretty well but to older dogs with arthritis, injuries or chronic health conditions the floor can be treachery. DON’T WAIT! SLIPPING CAN ONLY MAKE MATTERS WORSE. While sliding on floors is a common experience for dogs living in human made environments, each time your dog slips there could be damage to his joints. Slipping pushes joints abruptly into awkward positions which can wreak havoc on them. Also, dogs are such keen learners through conditioning that sometimes all it takes is a couple of slips for your mate to develop a slipping phobia. HOW DO WE TURN OUR NEW SKATING RINK BACK INTO A LIVING ROOM? 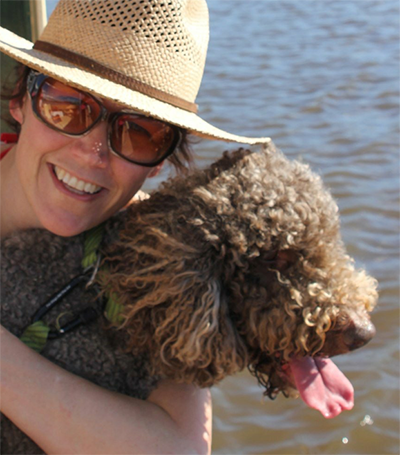 Here are some suggestions to keep your dog walking freely and comfortably as long as possible. Pretty much the first thing to check when slipping occurs is your dog’s paws. Are the pads dry & cracked? Your dog’s paw pads are the best opportunity for traction on slippery surfaces. If the pads are dry or cracked now’s the time for some TLC. And there’s nothing dogs love more than a foot massage. If you hear tap tap tapping when your dog moves about you’ve got another issue to sort. Dogs in the wild would wear their nails down much quicker and more consistently. For companion dogs this is not always so. Ideally cut your dog’s nails short enough so you don’t hear a percussion solo whenever your dog makes a move. Longer nails not only keep the pads from making contact with the floor, they also can change your dog’s posture, disturb your dog’s natural alignment and they are prone to breaking and injury. So clip ’em Danno! Oh, and if you have a fluffy mate like a Golden Retriever be sure that interdigital fur is cut short in between the pads. Imagine trying to stop skidding while skiing on a hairball! I don’t like my chances. Once you’ve taken care of paw protocol as above see if your mate is still slipping. If so explore more options below. Slipping, sliding dogs will absolutely appreciate your efforts when it comes to non-slip floor coverings. Yoga mats are an excellent option for increasing traction on a budget. Just spread them out where your dog needs to go. Bonus: just think of all the new unepexpected locations you will be able to breakout in a downward dog! If you find them unsightly, carpet squares or carpet runners work well too for a larger investment. I’ve heard that clear non skid tape (inexpensive) can work a treat as well. Some quick research led me to Bunnings clear non skid tape. I haven’t tried it yet (and it may take the finish off your wood when you remove it) but you could definitely achieve a more minimalist look. PLEASE NOTE: When choosing your dog’s socks/boots you need to use a paw width measurement. Stand your dog on a sheet of paper, trace closely around 1 front paw and 1 back paw. Measure the widest distance across each of the tracings. It’s best to do both because sometimes you may require a separate size for front & back as the back can be quite a bit smaller. The width measurement is what you need to select your size using the size chart. The paw length usually does not have an impact on sizing. 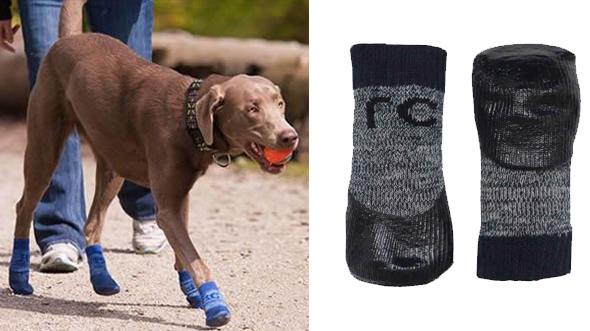 At $22.95 these non-slip dog socks are the low cost option for non-slip gear. And they actually do work really well. 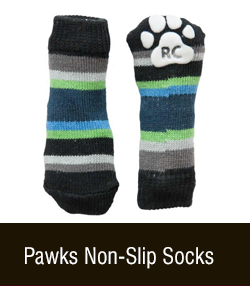 If your dog is a flashy dresser the Pawks offer some pizazz with bright stripes and even a faux sneaker look. 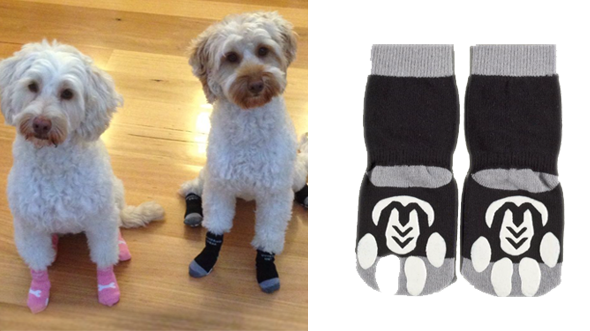 Power Paws are the first non-slip dog socks we got in at Waggle. And we were blown away by the number of dogs in need of socks! Power Paws attract really excellent feedback. 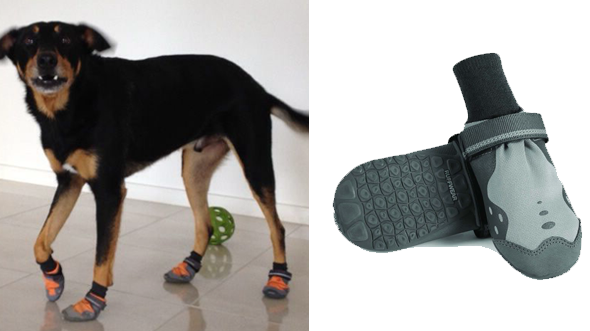 They now have a reinfoced toe which is great protection against jagged canine toe nails. They come in 2 different paw shape styles – very handy as some dogs have very long narrow paws while others have bulkier paws with narrower ankles. 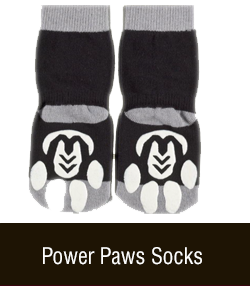 Biggest differences between Power Paws & Pawks Non-Slip Socks? It really boils down to the material (more cotton in the mix for Power Paws) the reinforced toe, and the fact that there are 2 shapes for the Power Paws. Oh, and the colours are a bit more down to earth for the more practical members in your pack. 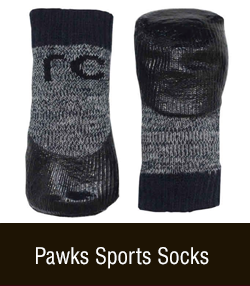 These socks offer a great mix of comfy sock with a flexible pseudo sole. There is a bit of water resistance as well because the toe upper and the sole are silicone dipped. I tend to recommend these socks for dogs who need indoor outdoor protection but can’t manage boots or if paws are too small for boots. 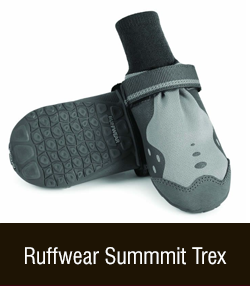 The Summit Trex Boots are an excellent antidote to slipping. If your dog will be venturing inside and out the Summit Trex are a smart choice. The moisture repellancy is handy. 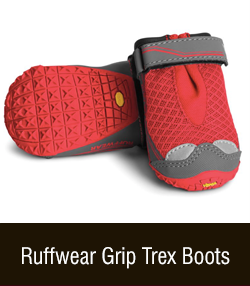 However the water resistance does make them a bit less breathable than the Grip Trex, so if your dog will be wearing the boots for long periods of time you might be better to go for the mesh uppers of the Grip Trex. The Grip Trex Boots are our best wearing boots. Super solid in construction they provide the best traction we can offer. Grip Trex soles are made from Vibram, the same high tech, lightweight material used for human hiking boot soles. These are my go to boots for pretty much all purposes because they have a mesh upper which gives your dog’s paw optimal breathability. And they have great lasting power. If you do require water resistance or a very flexible sole, however, the Summit Trex may be a better option for you. + Excellent protection against nasty bindis and other dangerous surfaces. I’ll just quickly mention the Ruffwear Boot Liners as well. 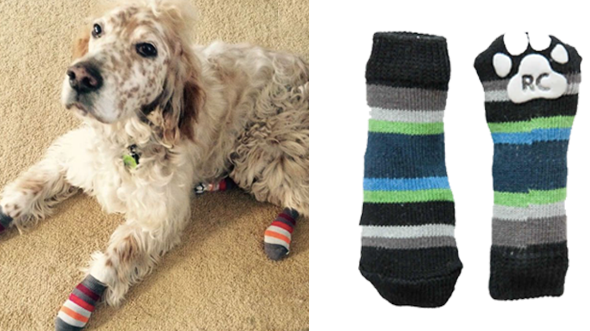 These are sporty athletic socks made of a synthetic material to a) wick away the moisture from your dog’s paws, b) reduce friction on paws in boots, c) and make it easier to slide the boots onto your dog’s paws. As these Liners are synthetic and slippery they are NOT designed to be worn without boots for traction. Just a heads up! The liners are great value for inside the boots though, especially if your dog has irritated or sensitive paws or paw allergies as they keep the paws as dry inside as possible. That’s it for today. If you have some great ideas from your experience in solving traction issues with your pack I’d love to hear about them! I can help get the word out about them too. I HOPE SOME OF THE THINGS I SHARED TODAY WILL BE HELPFUL TO YOUR BEAUTIFUL DOGS OUT THERE! If you have any questions at just ring me on 1300 725 781. Please leave a message if I don’t answer. I will always ring you back! 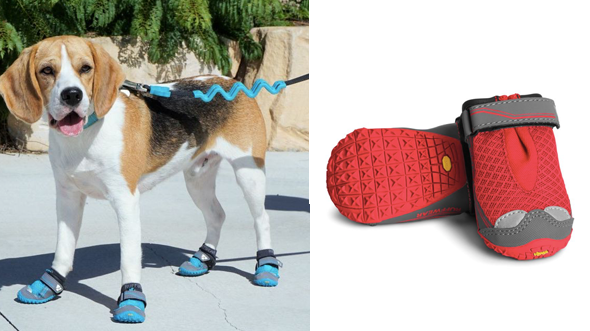 April 10, 2017 | Filed under Canine Health, Dog Gear, Living With Dogs, Uncategorized. This is a really great and comprehensive article. I have done research myself and eventually came across Musher’s Secret and also various brands of sox/boots. I think I mainly found info on Canadian sites. The fact that you’ve brought it all together, along with info as to how to measure your dog’s feet (back and front) is fabulous. Had I come across your article, I would have been ecstatic and saved myself several days of search and search. Moreover, you have a variety of sox/boots for sale with explanatory notes. Thanks muchly from me and my dog!